Bathing your horse doesn’t have to be a challenge. Follow these steps to make the process easier for you and your four-legged friend. 1. Make sure you have all your supplies on hand. Anything you will need for washing your horse should be readily available. Handy grooming tools include a sweat scraper, body brush, curry comb, mane comb, and dandy brush. Grab a hose with an adjustable nozzle, a step stool, horse shampoo, and leave-in conditioner (for the tail). Be sure to stand on a non-slip surface, and don’t stand directly behind your horse. This may seem obvious, but it’s easy to forget while you’re washing and trying to get those hard-to-reach places. Whether you’re bathing your horse outside or in a washroom, be sure to tie your horse in one spot with a quick release knot. If an emergency hits or your horse starts to panic, a quick release knot will allow you to let your horse loose before the situation gets too risky. Start by grooming your horse. Use a curry comb to help workout dirt, then a dandy brush to get out remaining debris. This is especially helpful for legs and hoof walls where mud might be caked on. If your horse has sensitive legs, avoid using a curry comb on them. When combing the tail and mane, use a mane comb (wide-toothed). Then use your fingers for any tough knots to avoid making your horse uncomfortable. 5. Clean your horse’s face. Your horse may not be fond of having its face washed, so try to be gentle. Don’t use a hose and avoid the shampoo. Use a sponge with clean water and ring out any excess. When wiping your horse’s face, be careful around the horse’s eyes and always follow the direction of the hair. 6. Wash your horse’s coat. Before you shampoo the horse’s coat, make sure to wet it down. You can use a hose if your horse will allow it; if not, try a sponge. Start by going over the hooves and the legs. Never use high pressure when using a hose. When you finish hosing down your horse, only use a small amount of shampoo on the sponge at a time. If your horse is particularly sensitive, consider using hypoallergenic shampoo. Like washing a car, you’ll want to do sections at a time. If shampoo is left on the coat too long, it can cause it to dry out your horse’s natural oils and dull the coat. It may take some time to thoroughly rise off all shampoo, but you want to be sure there’s no residue that could potentially irritate your horse later. This is done by wetting the tail and then using your hand to work in a little bit of shampoo. You can dip most of the tail into a bucket of water to rinse off soap. For the top of the tail, use a sponge with a mixture of shampoo and warm water. Make sure you also rinse off the top of the tail before drying with a towel. You can use a leave-in conditioner to help keep the tail from becoming tangled. Use a sweat scraper or your hand to help ring out excess water and towels to help dry your horse. If possible, walk your horse in a sunny area for roughly ten minutes to dry off. This also makes for good bonding time. To keep your horse clean, remove any manure from the stall before putting your horse back. The experts at Quarry View Construction can bring your ideal washroom to life. 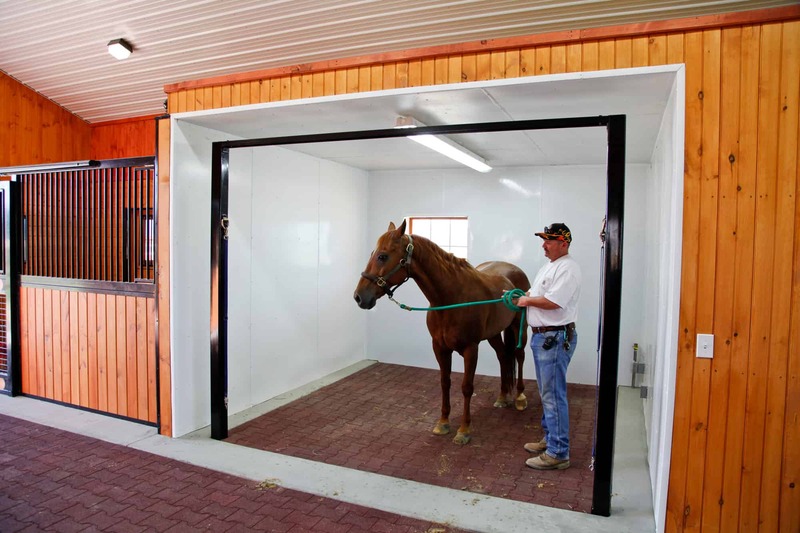 We design and build classic, top quality horse barns to fit your every need. Contact us today to get your project started.